So cozy and colorful. I love the starred scarf/snood. You always look so cheery! Thanks for linking up to Visible Monday. Love the dress, absolute perfection on you. If my throught is warm I am ok.
Oh thank you Sacramento. :) Yup you are right, Im not freezing if my neck is bundled up in something, being turtleneck, scarf or a snood. That jumperdress is colorful, indeed! 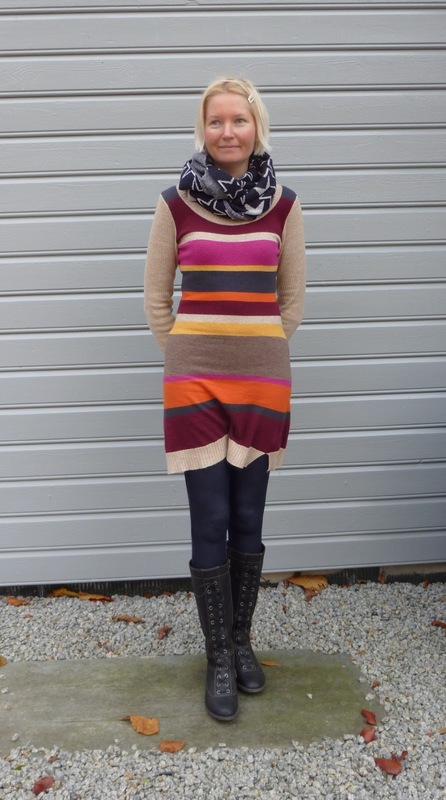 And it looks great with tights, boots and that fun print snood! Talking about mixing prints, this is a lovely outfit and it looks great on you! This cozy knitted dress is great on your slim figure, and the colours are beautiful, and very autumnal. The boots are fantastic, just what I'm looking for - in an extra wide fit! Winter's here too, cold, dark and awful! I can't wait to see the sun again, and the fresh green leaves on the trees! Beautiful dress - I love the stripes! What an awesome dress! The colours are amazing. This color blocking looks amazing on you. Especially with the star scarf. I love the stars on your snood. You definitely have the terrific figure for a lovely striped sweater dress. Gorgeous and cosy snood, I love the shape! Wonderful with your sweater-dress and tall lace-up boots, beautiful as always! I was so happy to see that Arianne featured you on her blog. You are both such cutie pies!